With a wide range of wire rope and chain hoists from Stahl we offer you the greatest variety of hoists in the world. That means flexibility for your logistics tasks. Every material flow requirement, however unconventional, can be solved individually and at a particularly favorable ratio of performance and cost-effectiveness. 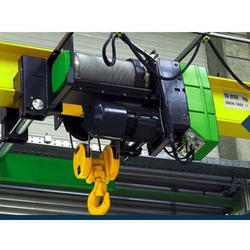 Efficient name in the industry involved in offering the optimum quality of Wire Rope Hoist. LIFTING SOLUTION Our electric chain hoists set a new benchmark in reliability, operating safety, and performance coupled with low maintenance cost. The new generation Electric Chain hoists from CARL STAHL CRAFTSMAN are compact and CE certified. A complete range is available from 250 kgs. to 3200 kgs. STAHL CraneSystems (INDIA) Pvt. Ltd.